Aquaponics is a combination of the words aquaculture and hydroponics, and the eco-innovative technology behind is similarly a combination of the two normally specialized production systems combined into one. The wastewater from the fish is used as resources in the horticultural production where plants take up the nutrients and hence cleanse the water before being returned to the fishes. Thus, aquaponics is a resource efficient closed loop food producing system. Aquaponics is defined as a sustainable system combining traditional aquaculture with hydroponics, where plants are cultivated in water. Effluents from the aquaculture are used as nutrients for the plants in the hydroponics, thus creating a symbiotic natural environment with maximum utilization of all raw materials and waste. The cleansed water from the plants are then recycled back to the fish tanks making aquaponics one of the worlds most productive food systems in terms of water, energy and nutrient efficiency. Aquaponics systems have three points of important control and production units: The fish tanks, the filters with nitrifying microroganisms transforming organic matter into in-organic nutrients for plants and thirdly the plant production itself. The systems can contain fresh water with production of herbs, vegetables or fruits, or salt water with algae and seaweed production. 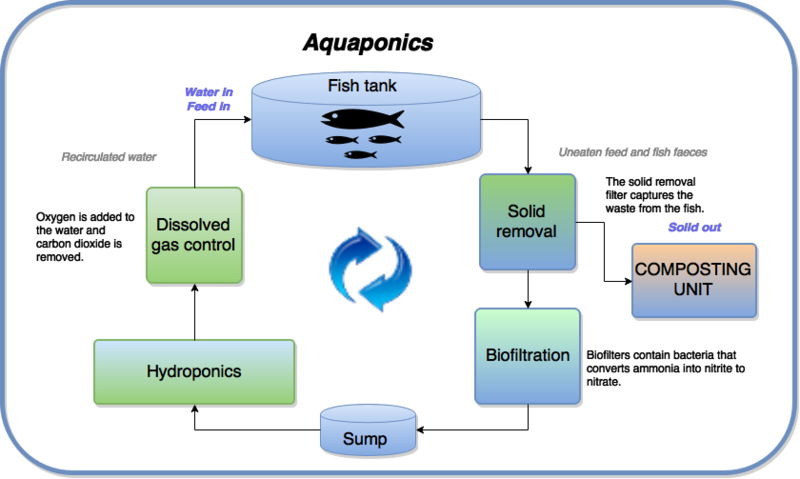 The challenge however for a modern Bio-food producer engaged in aquaponics is to maximize overall economic output by synchronizing the various biological growth periods and optimums of fish, plants and microorganisms into a stable and balanced biomass production system. In the same time high skills are required when operating on a larger scale commercial basis balancing between the need for securing a stable biological system and being flexible towards a market demand with fluctuating prices and changing consumer preferences.